The school and mission work are inseparably interwoven with each other. 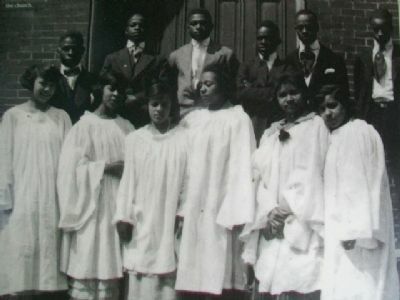 The Curtis Memorial Freewill Baptist Church served as a spiritual anchor in the lives of both the students and the teachers of Storer College. 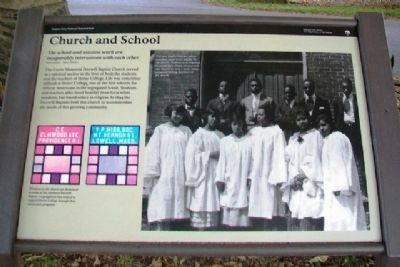 Life was sometimes difficult at Storer College, one of the first schools for African Americans in the segregated South. Students and teachers alike faced hostility from local white residents, but found solace in religion. 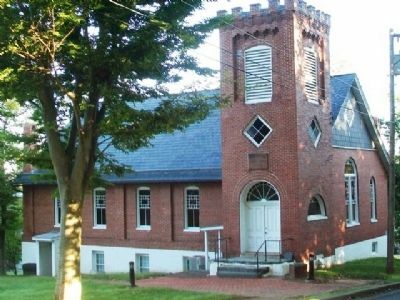 In 1894 the Freewill Baptists built this church to accommodate the needs of this growing community. The best singers from the school provided music every Sunday for the church. Students were required to attend daily chapel services and two church services a week. Many remained lifelong members of the church. 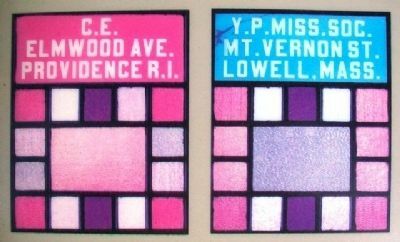 Windows in the church are dedicated to some of the northern Freewill Baptist congregations that helped to support Storer College through their missionary programs. 19.475′ N, 77° 44.446′ W. Marker is in Harpers Ferry, West Virginia, in Jefferson County. Marker is at the intersection of Fillmore Street and Storer College Place, on the right when traveling east on Fillmore Street. Touch for map. Marker is on the grounds of the NPS Mather Training Center. Marker is in this post office area: Harpers Ferry WV 25425, United States of America. Touch for directions. Other nearby markers. At least 8 other markers are within walking distance of this marker. Storer College Veterans Memorial Gate (a few steps from this marker); Foundations of Freedom (a few steps from this marker); Camp Hill (a few steps from this marker); Virginia Lodge No. 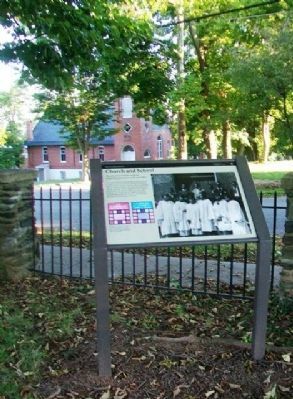 1 (within shouting distance of this marker); A Land Divided (within shouting distance of this marker); The Niagara Movement (within shouting distance of this marker); Storer College 1867-1955 (within shouting distance of this marker); Camp Hill during the Civil War (within shouting distance of this marker). Touch for a list and map of all markers in Harpers Ferry. More. Search the internet for Church and School. Credits. This page was last revised on June 16, 2016. This page originally submitted on December 17, 2013, by William Fischer, Jr. of Scranton, Pennsylvania. This page has been viewed 372 times since then and 5 times this year. Photos: 1, 2, 3, 4, 5. submitted on December 17, 2013, by William Fischer, Jr. of Scranton, Pennsylvania.